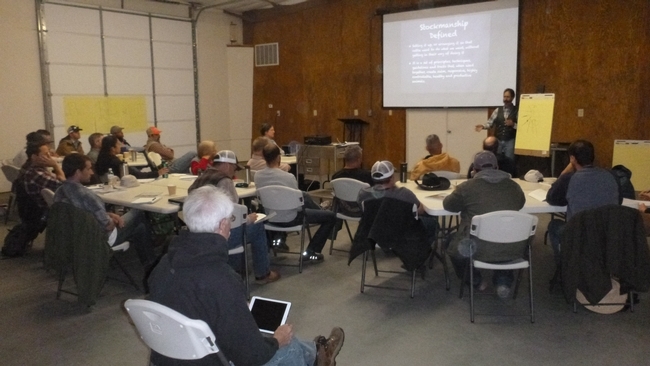 On October 21st and 22nd, UCCE Farm Advisor, Roger Ingram and the Sierra Foothill Research and Extension Center hosted a Low-Stress Stockmanship School taught by Steve and Susan Cote. Steve has 27 years of experience as a range-soil conservationist for the USDA, and over 17 years of experience instructing others on the practices of stock handling based on the teachings of Bud Williams. Steve believes that animals that are handled properly will allow for better range management applications and better overall health. During the two day event Steve discussed the practices of approaching and moving a herd, placing cattle, weaning cattle in a field setting, sorting cattle, working stock in facilities, and Bud box design and use. In addition to time in the classroom, the students also had the opportunity to put their newly learned skills to use, working cattle in both corral and pasture settings. A total of 24 participants were able to take home useful strategies to apply on their own operations.SFREC would like to give a huge thank you to Steve and Susan for sharing their incredible knowledge and to Roger Ingram for planning the event. Participants watch low-stress handling techniques in action. 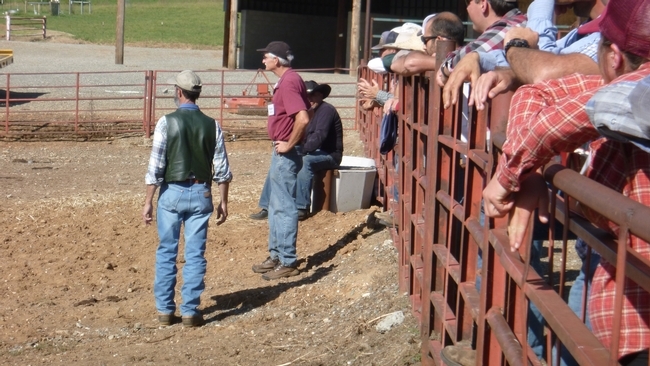 Participants can use these new techniques to inform their own livestock handling efforts. 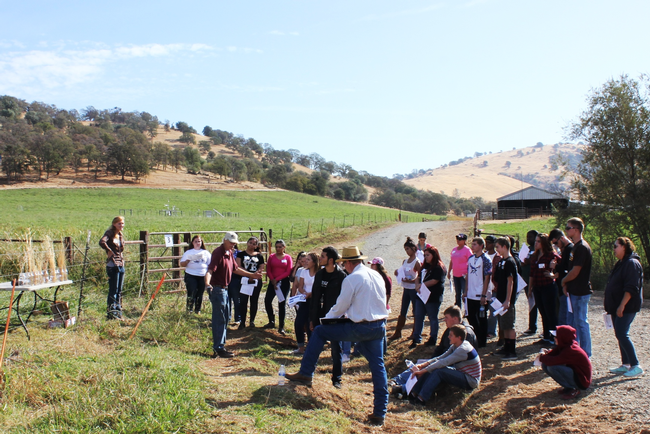 Highschool students learn key principles about rangeland health and pasture management from Roger Ingram, local UCCE Placer-Nevada County Director and Farm Advisor, during the Beef and Range Field Day held last October. 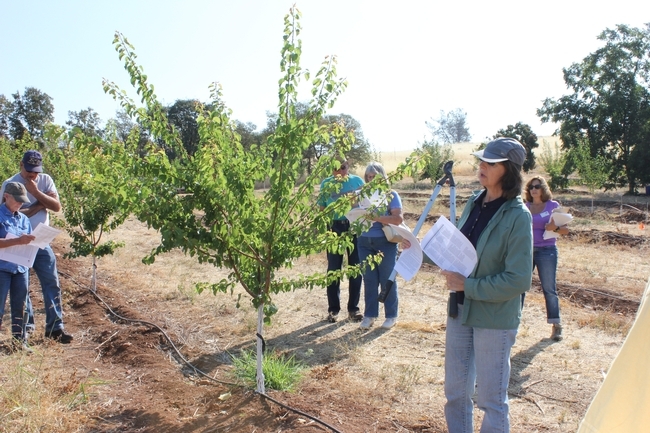 The UC Sierra Foothill Research & Extension Center (SFREC), located in the foothills northwest of Sacramento, has progressively been expanding the extension and education programs offered at the 5,700 acre center. 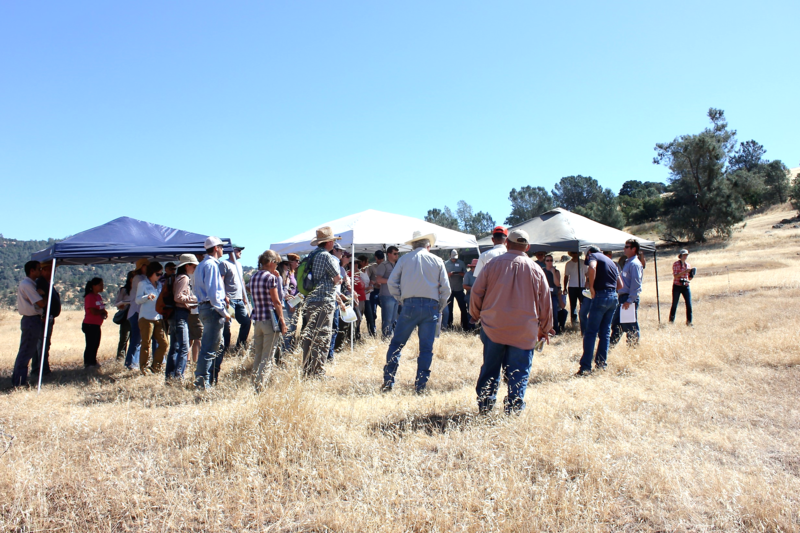 Over the past few years, SFREC has built upon existing extension and education programs to offer a variety of topical workshops for land managers, tours for university classes as well as field labs for students. In the past year, the center has hosted five region-wide workshops and meetings, as well as hosted more than 900 students from 23 schools. 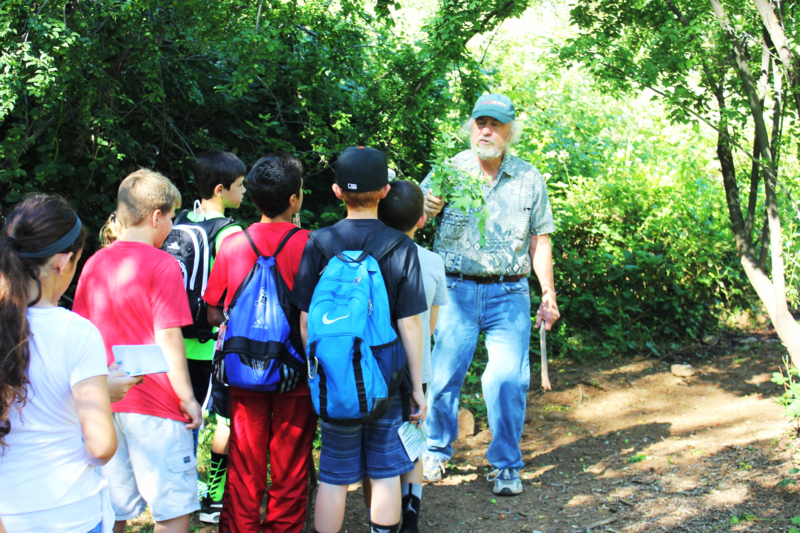 Workshops and tours have covered key agricultural and natural resource topics including invasive plant management, grazing principles, oak woodland management as well as beef cattle health and production. Classes from multiple universities across northern California and several western states have visited to learn about current and ongoing research involving best management practices on oak-woodland landscapes located in a Mediterranean climate. UC SFREC is now at an exciting point in its history where it is able to build off of this early success and hire a full time science educator to expand educational programming at the center. 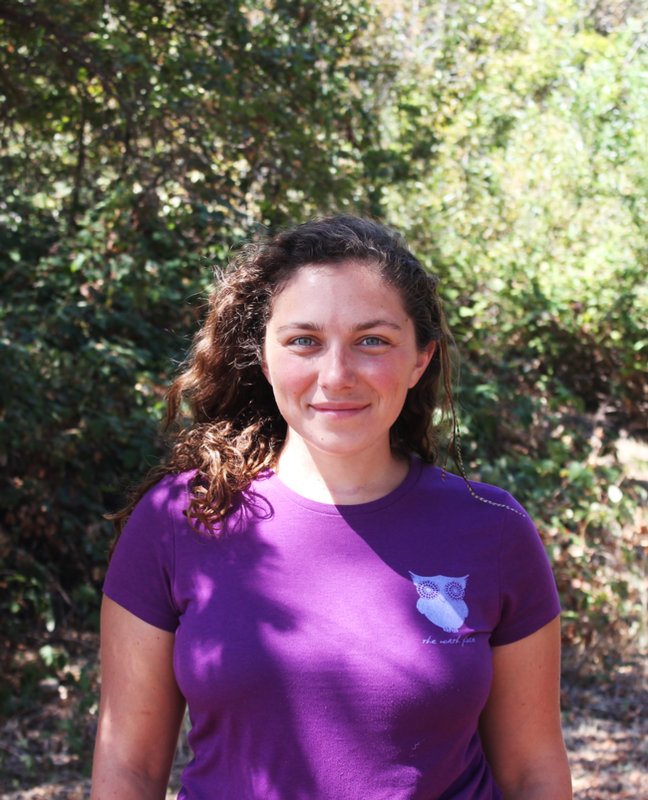 Ali Stefancich joined SFREC this month, filling the role of Environmental Science Educator. Ali Stefancich joined the U.C. SFREC community as an Environmental Science Educator at the beginning of August 2016, after completing an environmental education fellowship in Vail, Colorado. Originally from Downsville, New York, Stefancich brings a balanced diversity of experiences from across the nation. Stefancich earned a Bachelor's degree with a focus in ecology from the Evergreen State College in Olympia, Washington. Working with the Sierra Streams Institute after graduation, Stefancich gained a deep appreciation and expanded knowledge of the vast and valuable Yuba River watershed and adjoining ecosystems. “In my previous positions, I've worked a lot as a support role helping to instruct different groups or in helping to build the programs. I'm really excited to have the opportunity to be a leader and…put all of my experiences to good use,” shared Stefancich. Specific programs Stefancich hopes to enhance and facilitate at SFREC include youth centered education, community engagement and investment, as well as collaborations with neighboring agencies and organizations. Afterschool opportunities, grade and subject-specific field trips for students, and boosted 4-H club interactions are primary avenues being explored to increase youth involvement at SFREC. An open-house style workshop showcasing current research and natural resource topics is in the works. 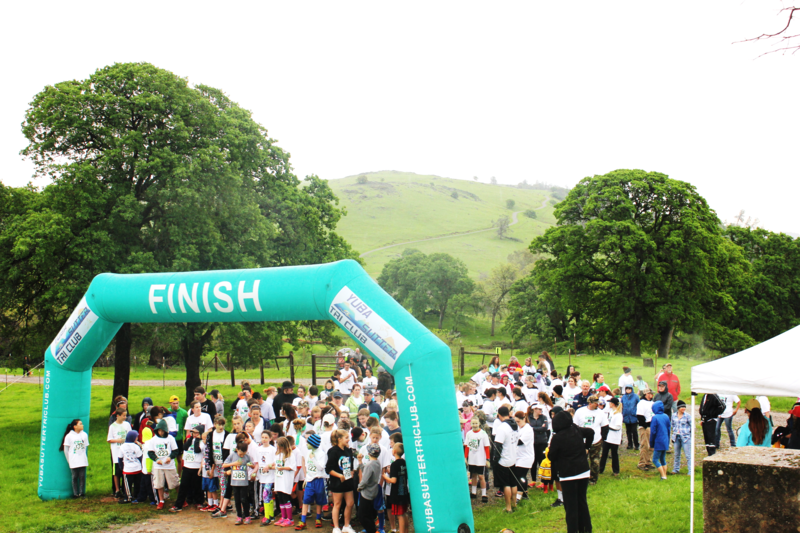 Children, teens and adults gear up for the start of the first annual Color Me Green 5k Run held in March 2016. “One of the main things is to increase our visibility so that the community knows this is a resource and what it is being used for, the research that is being done here, and how that impacts our understanding of natural resources,” shared Stefancich. Stefancich is highly motivated to build and strengthen relationships with local groups and organizations, as well as strengthen partnerships with U.C. Cooperative Extension, particularly 4-H Youth Development Programs. Excellent headway has been made regionally to connect underrepresented youth to science-rich experiential learning through programs like Youth Experiences in Science (YES) and Water Wizards. “Another goal is to establish easy avenues to relate the research that's being done here to people who can use it, too. I'd love to get more volunteer involvement and get people really connected with what's going on here,” said Stefancich. Participants visit a field site at the Medusahead & Barb Goatgrass Workshop held in June 2016. Ali Stefancich encourages educators, youth program organizers, local agencies and fellow UCANR representatives to contact her to discuss learning opportunities for the near future. You can reach her through email, astefancich@ucanr.edu, or by phone, 530-639-8807. Students from the Browns Valley Elementary School learn about local flora and fauna from retired specialist, Dr. Doug McCreary. 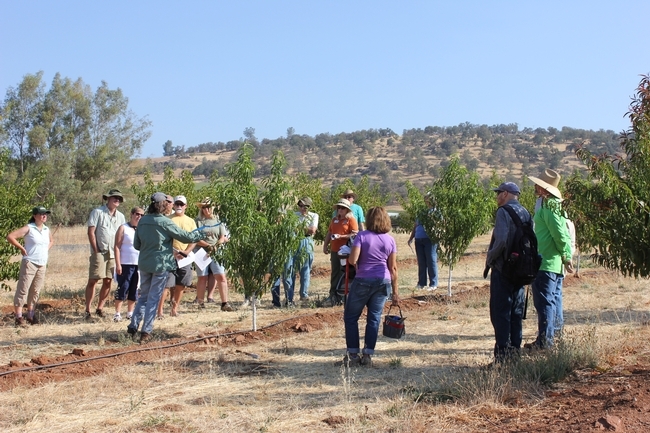 At the Sierra Foothill Research and Extension Center in Browns Valley, our mission is to foster and support research, education and outreach programs focused on key agricultural and natural resource themes relevant to the Sierra Foothills. Ultimately, our job is to manage rangeland, pasture, water and livestock to support a multitude of research. While our focus might differ from a commercial ranch, drought presents us with many of the same challenges. And while we're finally getting some rain as I write this, we are currently considering a variety of drought-coping strategies. We have cow-calf pairs that belong to the UC Davis Animal Science Department. These are fall-calving cows. In normal years, the calves are weaned in late May, and the cows are grazed on dry forage during the summer and fall. Currently, this herd is split into 3 groups – older cows with calves, second-calf heifers with calves, and open cows with calves. We have bred heifers also belonging to the UC Davis Animal Science Department. These heifers are typically grazed on irrigated pastures during the summer and through fall calving. We have outside heifers that are part of a foothill abortion vaccine trial. These heifers will be preg-checked in mid-April. 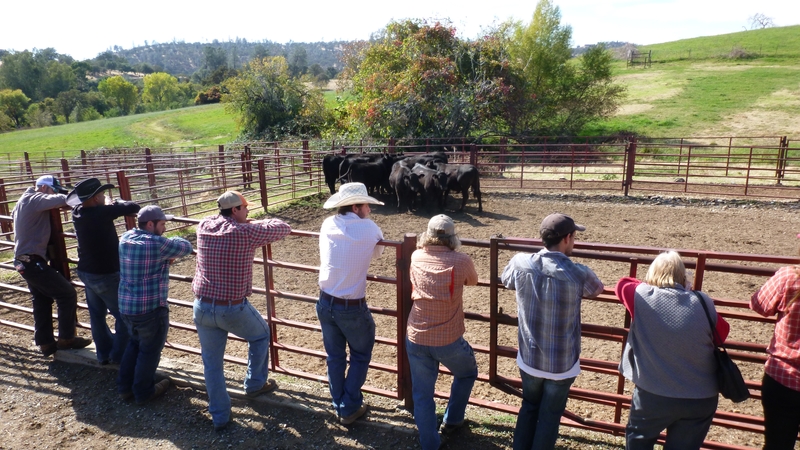 Normally, the open heifers would be kept at SFREC until late May. We have steers that are part of a long term adaptive management and targeted grazing research project. 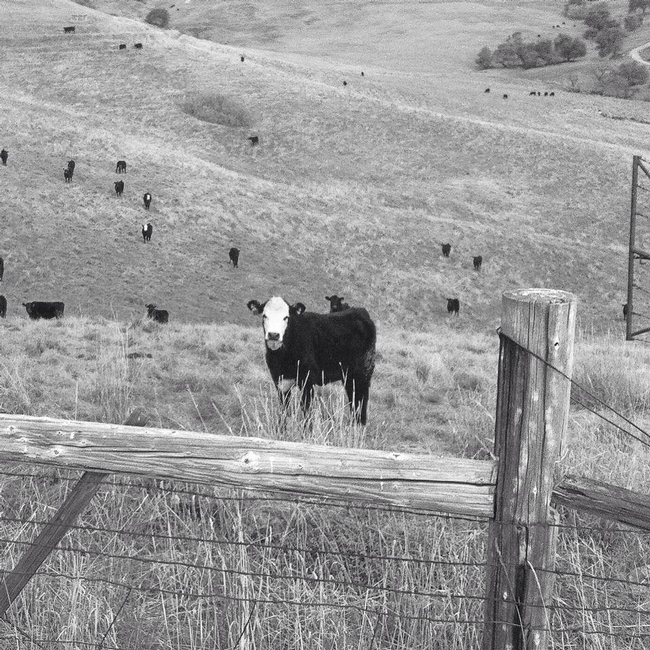 Like the heifers, these steers would be kept at SFREC until late May in a normal year. But this year is anything but normal! After a very promising fall (with normal germination of our annual grasses and near-normal forage growth through the end of December), we are now coping with a fourth year of drought. Since January 1, we've measured just 2.43 inches of precipitation (average for January-March is 11.69 inches). With the lack of rainfall, forage growth has slowed (total production through April 1 was 1400 pounds per acre, which is about 100 pounds less than normal for this time of year). Total production doesn't tell the whole story, however; the pastures that we've grazed since the first of the year haven't recovered as expected (which means we haven't returned to these pastures as expected). 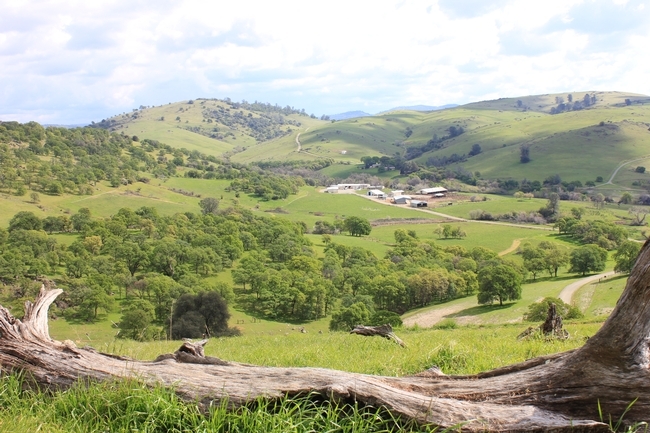 My colleagues who have worked at SFREC for a number of years tell me that the vegetation is at least 30 days ahead of schedule – in other words, our annual rangeland looks more like mid-May than early April. All of this means that this week's rain will help in some pastures, but it's “too little, too late” in others. Our peak standing crop (the total amount of forage grown during this growing season) will likely be far below our long term average of 3000 pounds per acre. As spring turns to summer, we typically put the cattle with higher nutritional demands (mostly bred heifers) on irrigated pasture. The Browns Valley Irrigation District (BVID), our source of irrigation water, has indicated that they will start delivering water around April 15 this year (which is normal). They think they'll probably shut off the season 7-10 days early this year (sometime in early October). Ship the open foothill abortion heifers 7-10 days following preg-check. This will allow us to take as many as 150 heifers off the pastures at SFREC. Ship some of the steers (at least those in pastures where feed is not re-growing) by early May. If we do happen to get some late-spring moisture, this would allow some regrowth for next fall. This week's rain may be enough to get us through to the end of May. Ship open cows and calves. There are only 13 pairs that fall into this category, but every little bit helps! Wean early. Some of the Animal Science calves already weigh more than 500 pounds. Another large group is between 450 and 500 pounds. Weaning the calves now and shipping them off SFREC, will reduce the nutritional demand on the cows, and will reduce the forage demand (both from cows and from big calves) on our rangeland. 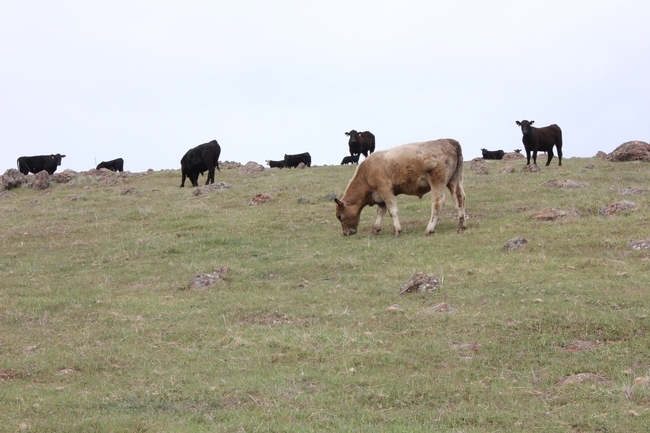 Because most of our forage base at SFREC (like much of California) is annual rangeland, we have to manage our spring grazing to ensure that we have enough dry forage through the summer and fall months. We also want to make sure that we leave enough residual dry matter to protect our soils and provide a microclimate for germination when it does rain again next fall. On commercial ranches, decisions like those I've outlined take on profound economic consequences – the impacts of shipping lighter calves, selling replacement heifers, and culling the cow herd more deeply than normal can be felt for years to come. At SFREC, these decisions can impact long term research into important topics. Ultimately, however, the long-term health of our rangelands is our greatest responsibility. For more information on long-term weather and forage production trends in the Sierra Foothills click here. If you are interested in getting more information managing through low rainfall/forage years SFREC has a number of videos and publications that explore this topic. To get more information about how producers can benefit from forage production data, click here. 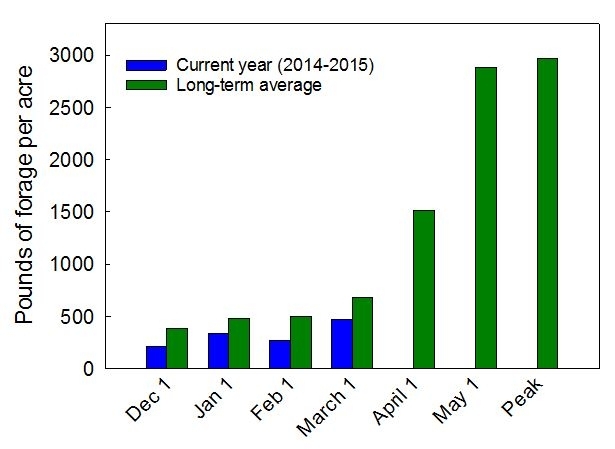 UC SFREC staff has been closely monitoring the seasonal pattern of forage production at the Research and Extension Center for over 30 years. These observations provide the longest running data set in the region to compare how the precipitation we receive each year influences the timing and amount of forage production compared to what we might expect on average. While this year is not as bad as last year in terms of forage production, the very dry January and February has not put us on a good foot as we head into early spring. Between January and February we should get about 10 inches of rain at SFREC but this year during this time period we only received about 25% of that amount. As a result, as of March 1st we only have about 475 lbs of forage per acre on the ground while on average we would expect about 700 lbs of forage per acre. We went through January in a precarious state with only about 270 lbs of forage per acre on the ground by February 1st when normally we should have about 500 bs of forage per acre by February 1st, so the brief wet and warm period we had in early February (precipitation totals) did help us reduce the forage deficit. March is our second largest forage production month where on average we grow more than 800 lbs per acre ac so we need to see close to 1000 lbs per acre of growth in March to get us back on track for the season. While March 1st is an indicator of how well things were (or not) for the winter months, April 1st has always been a better gauge as to where we might end up at peak standing crop. The table below shows several years that had similar forage values on March 1st but ended up with large differences in forage by the end of spring. For example in 1979-1980 we started March at 500 lbs per acre and by the end of spring ended up with total forage production that was 56% of average while in 2001-2002 we started March at 447 lbs per acre and by the end of spring had forage production that was 93% of average. Last year, with the severe drought, we started March with 400 lbs of forage on the grounded and by the end of spring forage production was about 77% of average. It is difficult to predict how this season will turn out as of today, but March is not looking too encouraging in the way of predicted precipitation for the month. While this weekend's 0.21 inches of precipitation was a welcome site we are going to need more than a few thunderstorms to get us back on track. Our next round of data will come out shortly after April 1st and will give us a more definitive idea of where the rest of the growing season may be headed. 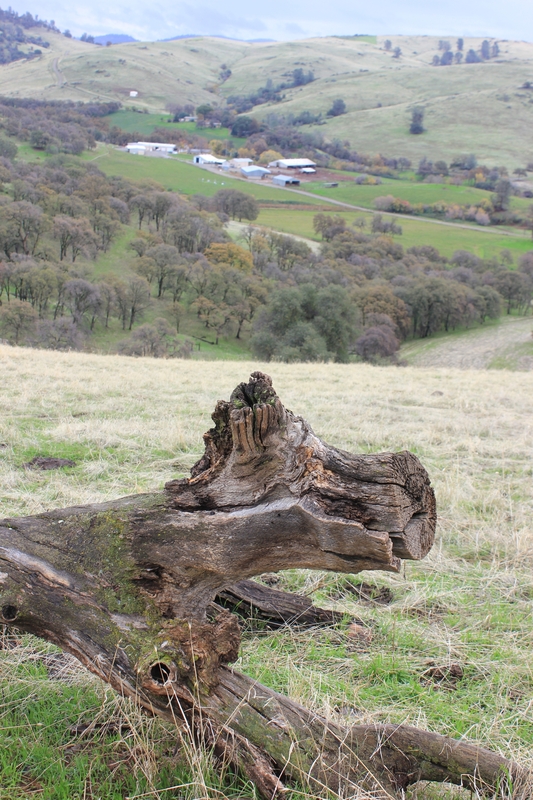 For more information on long-term weather and forage production trends in the Sierra Foothills click here. If you are interested in getting more information managing through low rainfall/forage years SFREC has a number of videos and publications that explore this topic.